Few people would dispute the fact that soaking in a hot tub or spa is an enjoyable experience. It is a wonderful way to melt away the stresses of the day. There are many ways a hot tub can contribute to your general health and wellness. What may be surprising to some people is the fact that hydrotherapy can provide much needed relief to those suffering from joint pain and arthritis. Arthritis affects over 50 million people. The condition creates painful swelling and inflammation in your joints and, overtime, reduces mobility. Hot tubs and spas provide a flow of warm water which eases muscle tension and relieves pressure on surrounding nerves, joints, and blood vessels. 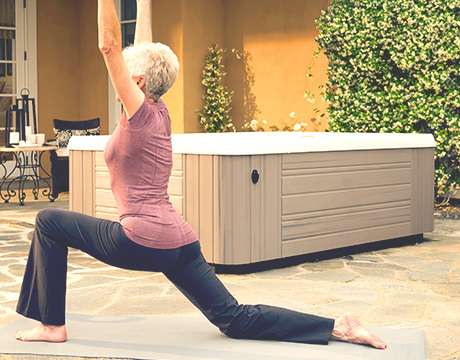 Here are seven ways how hot tubs, including Hot Spring® Spas hot tubs, can alleviate the often debilitating pain of joint stiffness and arthritis. People suffering from arthritis are often more sedentary due to painful joints and decreased mobility. This can lead to both a decrease in circulation and an increase in inflammation. The combination of heat and pulsating, massaging jets increases circulation in your body. This process is known as ‘hydrotherapy’ and has been reported to reduce inflammation while improving joint mobility and flexibility. These beneficial health effects have been reported to last for hours after exiting your hot tub. Heat therapy is often recommended by physicians for all kinds of body pain. Heat has been shown to be especially beneficial in reducing swelling and inflammation of joints and muscles. Heat therapy works to relieve pain in several ways. First, it dilates blood vessels, stimulates circulation, and reduces muscle spasms. In addition, heat alters the sensation of pain. The heat of a hot tub envelops your entire body to relieve pain in many areas of the body – all at once. If you’re already feeling the effects of joint stiffness or arthritis, chances are you may have experienced a decline in your exercise routine due to pain and stiffness. The good news is a hot tub can help by reducing the weight on your joints, therefore allowing more movement with less pain. The buoyancy of the water makes you feel lighter, which increases freedom of movement and relieves pressure on your joints. In fact water can support up to 90 percent of your body weight. Stretching while in the water can loosen stiff joints and relieve pain. The calming sensation of floating in space provides relaxation which lasts for hours after you’ve completed your hot tub session. Many physical therapists and masseurs recommend gentle to moderate massages for general pain relief. Studies have shown that regular massages can lead to improvements in pain, range of motion, hand-grip strength and overall functioning of the joints. The pulsating jets of hot tubs can pinpoint joints and offer a gentle, yet effective massage by the hot tub’s jets. Massages increase circulation and relieve pressure on joints, which reduces inflammation in the body. It also releases serotonin which relaxes the mind and body and works to improve mood. These pain relieving benefits can last long after you get out of the hot tub. Many doctors and specialists recommend gentle exercise for joint pain. However, it is often difficult to perform traditional exercises in a gym or even in a chair when you are suffering from arthritis. Water provides the perfect environment for pain-free exercise because there is little to no pressure on your joints. Water exercise increases range of motion and flexibility. In addition, water adds gentle resistance which allows your muscles to work harder with less perceived effort. This provides great cardiovascular conditioning with little to no strain on your joints. Often times, doctors, including primary care physicians will advise their patients with arthritis to lose weight. A change in habit to lose weight can be difficult for people who also suffer from pain. The ability to exercise more frequently in water without pain may help with weight loss. Less weight reduces the amount of strain on joints and can help alleviate some of the painful symptoms of arthritis. People who suffer from chronic pain often have trouble falling and staying asleep. A good soak in your hot tub approximately 60 minutes before bedtime can lead to falling asleep faster as well as a more restful night’s sleep. Studies have shown the process of raising and lowering body temperature before bedtime helps you fall asleep faster. Soaking in a hot tub for 20 minutes is an effective way to raise your body temperature. Then, as your body cools itself, it becomes more relaxed, allowing you to fall to sleep more quickly and deeply. Rest is frequently recommended as a treatment for chronic pain. There are few things more restful or relaxing than a soak in your hot tub. The warm water and massaging jets can help reduce blood pressure and release endorphins which improves mood. Meditation has been found to be helpful in relieving the pain associated with arthritis. The warm water combined with the calming sounds and gentle massage of the jets relaxes the mind and allows for peaceful meditation. Hot tubs have been found to be beneficial for your overall health and wellness. The powerful combination of heat and massage are why they are often recommended as a form of therapy for pain relief. The relaxing benefits of hot tubs can help you get through your day and sleep better at night. At Seven Seas Pools and Spas, we carry high quality spas from Endless Pools® Swim Spas, Hot Spring® Spas, Caldera®, and Freeflow® Spas. No matter what your concern, our team of professionals can help you find the perfect hot tub for all of your health and relaxation needs.